Japan rests on some of the most unstable ground in the world, which has triggered earthquakes for centuries, and subsequently the nation’s nuclear industry is under severe scrutiny following last year’s nuclear disaster. Recent criticism escalated after a government panel investigating the Fukushima disaster, claimed that the island nation is prone to natural accidents, and demonstrated there is a need for sweeping reforms of the nation’s fundamental approach to disaster preparedness. Before the Fukushima nuclear disaster, earthquakes caused by linked movements of multiple faults, and earthquakes that involve so-called normal faults, were not taken into account in safety examinations of nuclear power plants. The Nuclear and Industrial Safety Agency (NISA) has acknowledged that it would order a reassessment of geological data after seismologists showed that there were potentially active faults under Ohi nuclear power plant, the Tsuruga nuclear power plant, and the nearby Shika station, operated by Hokuriku Electric Power Co. 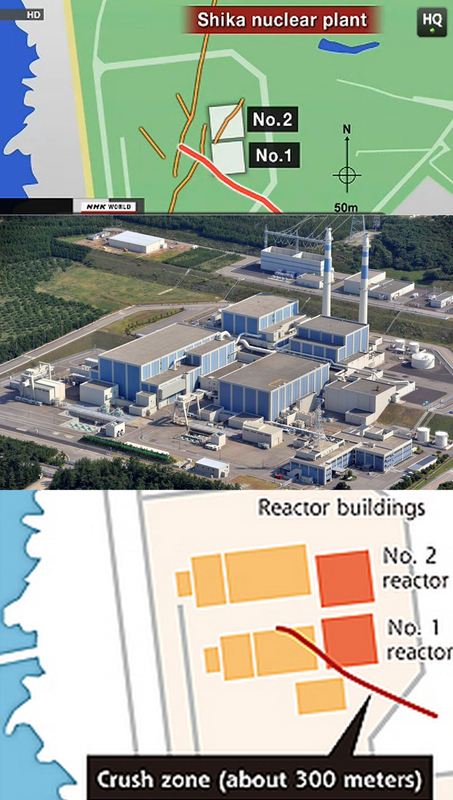 The two boiling water reactors which comprise the Unit 1 and Unit 2 reactors at the Shika nuclear power plant account for 20%-30% of the Hokuriku Electric’s total power generation capacity, but may both face decommissioning if it is confirmed that both reactors are in fact built on top of separate earthquake faults. Recent reports have found that eight underground faults which were judged 25 years ago to not be a hazard to the Shika nuclear reactors, have not been reassessed since, despite a 2006 government order that all seismic activity around the nation’s nuclear reactors be reassessed. Last week, a government panel of experts said that a 300-meter-long crack extends about 250 meters below the Unit 1 reactor at the Shika nuclear plant is “highly likely to be an active fault,” and expressed the need for further investigations despite multiple government nuclear safety screenings and the utilities repeated promises for over 25 years that they are inactive. The findings at the Shika plant showed that the fissure is most likely a reverse fault, revealing a vertical fissure in the layer of earth underneath the Unit 1 reactor, which showed undisputable evidence of having been forced up and down. Experts have proposed these signs may have been created when the bedrock was violently broken leaving “a scar in the geological layer” an estimated 120,000 to 130,000 years ago. Seeing as another fault has been reported underneath the Unit 2 reactor, experts warn that if the two faults were to shake at the same time, it could seriously endanger the plant operations. While two government surveys had previously determined the faults were not an active, NISA re-examined Hokuriku’s geological drawings, as mandated by orders dispatched after the Fukushima disaster, and concluded a long depression the utility had long blamed on water erosion could actually be the mark of a fault line. Mitsuhisa Watanabe, a professor of geomorphogeny at Toyo University, said: “By examining the drilling survey drawings, the fissure looks like an active fault to me. After these revelations, at a NISA hearing held Tuesday, the experts concluded the fault should have been detected before the Shika plant was built. NISA says the possibility of the fault being active may have been overlooked in both of the geological surveys at the plant’s site, as government officials did not question the utility’s explanations. On Wednesday, the Hokuriku Electric Power Company submitted a plan to NISA, revealing its plans to study the underground faults beneath the facility to check for traces of seismic activity. The results of the investigation will be reported to the government after the work is completed in January 2013. The president of Hokuriku Electric Power Company Susumu Kyuwa has said the safety of his company’s nuclear power plant has been established by the government’s own testing, and also noted the utility will activate thermal power plants in response to consumers’ concerns over possible power shortages. This week, Masanori Tanimoto, the governor of Ishikawa Prefecture, the prefecture which hosts the Shika plant, announced that he wants to know why the government ordered the probe of a seam it deemed safe 25 years ago based on the same data, a reminder that some warnings about nuclear safety in Japan have long predated the 2011 Fukushima nuclear disaster. Tanimoto said the government should clarify its position and ensure the validity of expert reports rather than believe whatever scientists say.